Want to use Emblem/Logo Click Here We offer a full line of ceremonial and honor cords, tassels , Stoles, Sashes other celebratory items. Grad Stoles and Sashes for Schools & Colleges. 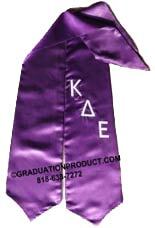 We supplies honor sashes for graduates to wear as a keepsake on graduation day. Order your custom grad stole now. Fast Shipping. Plain Sashes available in more then 30 colors. All Plain Sashes orders are Delivered within 2-3 days from Order. Order Now ! Sash Details 61" Long All Together30.5" Long On Each Side5" Bottom Width Front Ends In Point Contours To BodyStole Fabric Light weight Polyester Shiny Satin Machine Woven 155 GSM Rich In Color. Where to buy high quality cheap custom graduation stoles? There are several online website which is giving simulator for making sash , But we have a dedicated team for sash design, Once you place order of customized sash, order deatails is forwarded to desingner and they will craft your design. Our online tool for making your sash is very simple, you can add left and right side of your sash and increase font size, rotate text, move text, edit text and all features you want. After submiting your design a sample design of your sash will be added to you cart as product image. We own our factory so you are certain to get the best custom graduation stoles at very affordable prices. From Stoles with Trims to Standard Stoles, we guarantee you discount pricing based on quantity, hence, you are assured of the best prices on bulk purchases.